The propeller that came with your new engine isn't necessarily the one that is best suited to your needs. This is because many original equipment props, understandably, are made to meet a range of average conditions for many kinds of boats, hull styles, and loads. This can limit their performance. 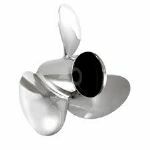 What you need is a propeller specifically selected for your kind of boat, and your style of boating. The size of a propeller is described using two sets of numbers. These correspond to the diameter and pitch. 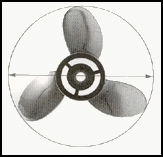 The pitch always follows the diameter when describing a propeller. Diameter: Diameter is two times the distance from the center of the hub to the tip of the blade. It also can be looked at as the distance across the circle that the propeller would make when rotating. It is the first number listed when describing a propeller. Pitch: Pitch is defined as the theoretical forward movement of a propeller during one revolution -- assuming there is no "slippage" between the propeller blade and the water. For most boats, there is slippage and therefore the distance advanced is less than the design pitch. The amount of slippage varies from boat to boat. Pitch is the second number listed in the propeller description. Cupping: Many of today's propellers incorporate a cup at the trailing edge of the propeller blade. This curved lip on the propeller allows it to get a better bite on the water. This results in reduced ventilation, slipping, and allows for a better hole shot in many cases. A cupped propeller also works very well where the motor can be trimmed so that the propeller is near the surface of the water. The cup will typically result in higher top end speed on one of these applications. Rake: Rake is the degree that the blades slant forward or backwards in relation to the hub. 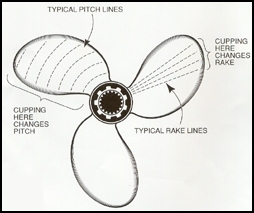 Rake can affect the flow of water through the propeller, and has implications with respect to boat performance.